I don't think I've ever been so excited to post about a cake before. I am so proud of this cake! I volunteered to make it for my friend's daughter's sixth birthday. I had been planning it for the last few weeks and it was just rewarding to see it come to life. I think I probably went a little overboard, but you only turn six once! This is my second attempt working with fondant and it went a lot better this time. For one, I used different brand which tasted absolutely delicious. I also took my time and read up on techniques a bit before I got started. I still have a lot to learn, but I'll get there. I plan to take a few classes soon, I just need to just sign up. 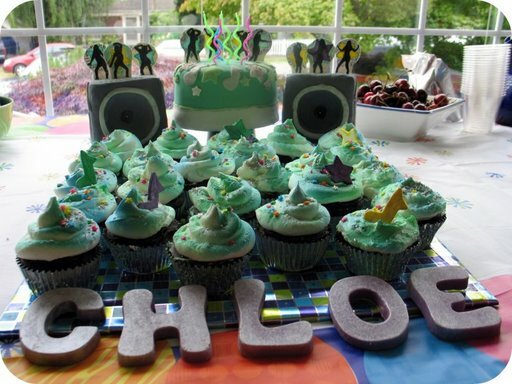 The speakers, cake, and cupcakes were made of chocolate cake, filled with vanilla pastry cream. They were topped with a thin coat of milk chocolate ganache and a basic vanilla buttercream I spray painted with Witon Color Mist spray (totally fun!). 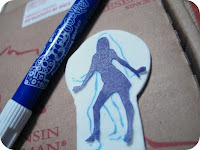 The dancers were made out of gum paste that I created using clip art that I cut out and used as a stencil. 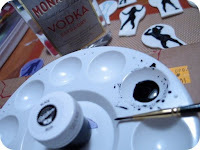 I traced each one with an edible ink marker and eventually painted them with food coloring gel thinned with vodka. The look on Chloe's face made all the work totally worth it. I think I may have spoiled her a bit. Can you imagine what her wedding cake will look like?! :-) I got a little carried away taking pictures. Check out the lot of them here, or just sit back and watch the show! WOW! You did an awesome job! Everything came out GREAT especially as you had a lot of different steps and techinques working. 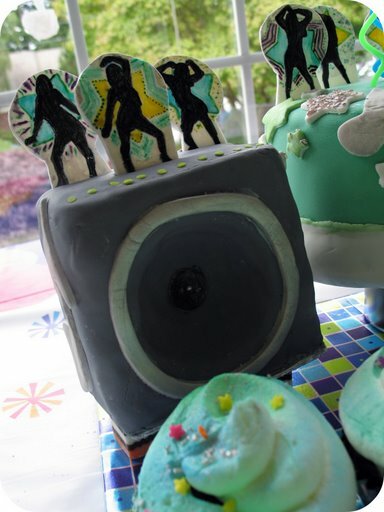 What brand of fondant did you use? And your food writers? I've tried Wilton but not with much success. Maybe it was user error. I read that you will be taking some classes...Wilton's? Again, my advice is research the instructor. You may know more than she/he does! Good luck! 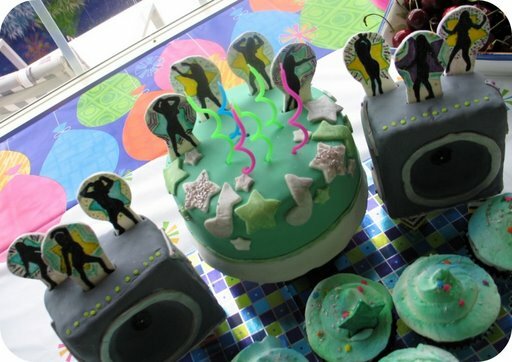 Now that is a fun cake. You rock! holy cow! my jaw dropped when i saw this. it's beautiful. chloe was probably over the moon! What kind of frosting is on the cupcakes? It looks soooo yummy! Sarah bell You know, I delivered the cake to my friend's house, stayed for the party for about a half hour and then left before they ate the cake. I just couldn't bear seeing it destroyed. 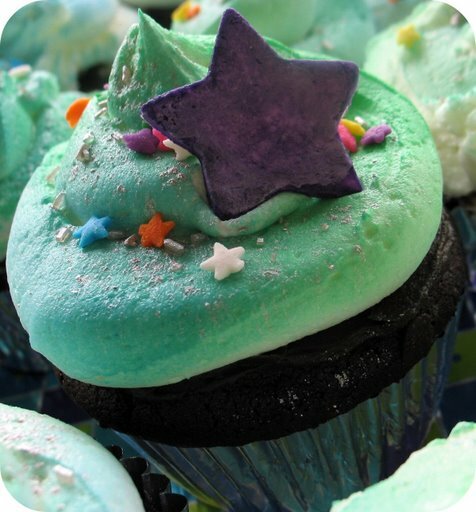 I have some spare cupcakes sitting on my counter though - come on over! Ingrid You're always the consummate cheerleader! The fondant I used was called Satin Ice. I found a local merchant that sells it by the pound! It was so good that I opened the bag in the car and ate some! As for the food writers, I used Food Doodler markers. I really wish they would make them with a smaller tip. I found them in the grocery store hanging next to the birthday candles! Tomorrow night the place where I am going to take the cake class is hosting a monthly "Cake Club" event. I'm not sure what to expect but I know they will be teaching a little course on cake brush embroidery. I think I'll be able to get a good feel for the instructors after I go. Thanks for the reminder though! heather Thank you! Chloe was pretty much in shock when she saw it. I think she was expecting a sheet cake with speakers and dancers drawn on the surface. She just stood there and stared at it with her Mom. It made the many hours of work worth it. Nicole Haha! I know, right? Cookienurse Thank you! Funny you should ask about the frosting. The first batch of frosting I made looked great when I piped it but melted and dripped all down the sides of the cupcakes. 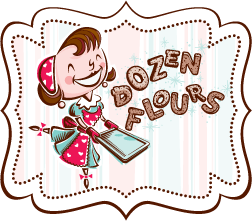 I had to scrape off the frosting off 2 dozen cupcakes while my hubby ran to the store to buy some shortening. I ended up making a Buttercream recipe I found on the Wilton website. I doubled it, except for the milk. I wanted it really thick. I would recommend doubling the vanilla. Although it was good, it didn't really taste like anything. I LOVE your party! Everything was so creative and utterly adorable! Great job! Very cool cake, Chloe was a lucky girl! pretty darn impressive. i love the frosting color! wow! I like you cake design, so chick and so gorgeous! You GO GIRL! that was a great cake - and only your second time with fondant!!! wow!!! Julia, that is unbelievable! I love the dancers! It's putting me in the mood for a dance party! My Sweet & Saucy Thank you!! I still can't believe I made it! danieltalsky Yay!!! (BTW I bought the new Bon Ivar CD and its AWESOME!!! Linda Yeah but she's a great little girl and totally deserved it. big boy oven Thank you!! Janel Waters - Haha! I know, right?! Normally I'm the first one in line to volunteer cutting a cake but this one as different. I just couldn't stand to do it! Are you kidding me? That is the cake that her wedding cake will now have to live up to in the future! She'll be looking at the white wonder and recalling her groovy dance party cake and wonder when being grown up got so boring and maybe she should have looked you up for this cake too:) But seriously....I wanna be 6 again! oh my god!!! freaking cuteness!!! and that lil chloe doll deserves it. i only wish that i could be six again (with an aunty julia).